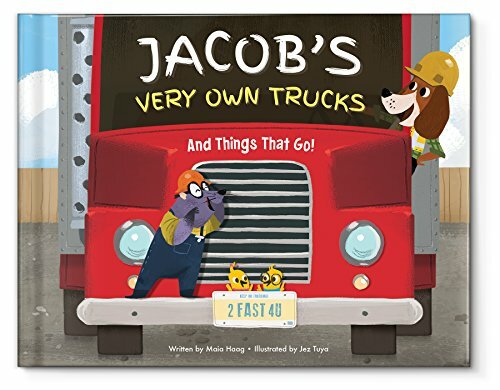 UNIQUELY PERSONALIZED TRUCKS BOOK - This truck book includes the child's first and last name, gender, birthdate, the sender name(s) for the dedication page and an illustrated encyclopedia with fun facts about 62 different vehicles. PERFECT FOR BIRTHDAYS, BABY SHOWERS AND HOLIDAYS! - This personalized storybook is a lasting keepsake for parents and kids, and helps children learn their letters. YOUR CHILD IS THE MAIN CHARACTER - Different vehicles bring letters one by one to spell out your child's first and last name in rhyme. HIGH QUALITY - This 30-page (approx. ), 11 by 9-inch hardcover book is made in the USA and is perfect for boys and girls ages 2-8.